These mascots were developed by the 2014-15 Earth Buddies and will become a permanent part of our school culture, celebrating and encouraging eco-friendly activities such as Fresh-Fruit-Fridays, Bike-to-School-Week, litter-less lunches, recycling etc. First introduced at the November 2015 Character Assembly, look for these characters throughout the year around the school and at events. Returnables are described as uneaten whole fruit and unopened food, juice, snacks. Such a waste of money and food that could be saved for after school or another day instead of going into landfill. 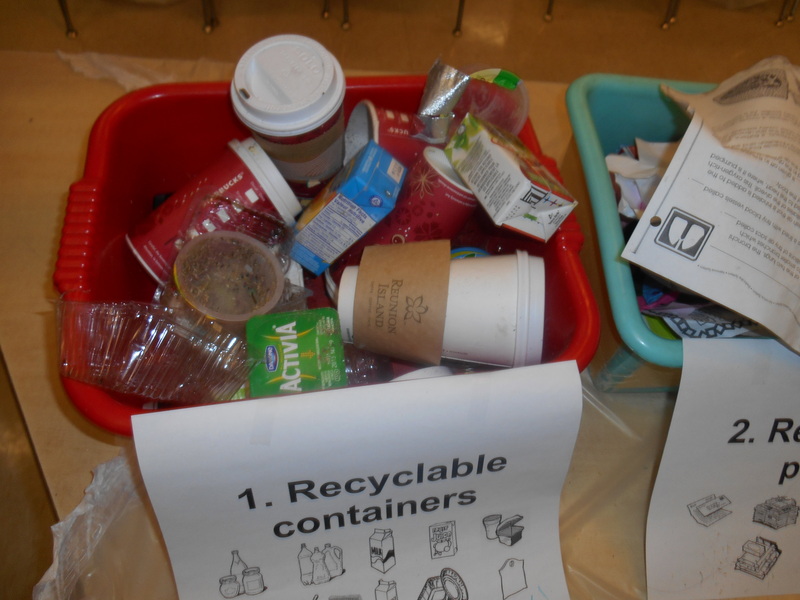 We have improved with compostables, perhaps due to the introduction of green bins at school. That’s great! We can improve with recycling, garbage (mostly packaging) and returnables (uneaten food). Help Howard reduce the waste from 7kg/day: bring litter free lunches, encourage students to save uneaten food for after-school snacks and sort waste from recycling. Another successful end to the annual SEED-TO-HARVEST FESTIVAL! Despite a brief rain shower and a few minutes of high winds, Earth Buddies cooked up a yummy soup using veggies and herbs from the learning garden and donations, thanks to Mabel’s for the gluten-free stock and Workshop for the giant pots. As a special treat this year, Earth Buddies preformed the Stone Soup Tale to students while they sipped their steamy soup. Our Eco-club “Earth Buddies” is for students in grades 3-6 , we meet bi-weekly at lunch in area 41 to discuss and investigate environmental issues as raised by the students. Through field trips, videos, activities and guest speakers students enrich their eco understanding and act as ambassadors to the whole school by planning events, activities and awareness campaigns. Past and annual events include: the waste audit, seed-to-harvest festival which culminates in stone soup, battery/e-waste collection and used toy drives during earth week, vermicomposting and bike powered blender demos to name a few. Last year we successfully rolled out green bins at school and this year we hope to add recycling bins outside. Our goal is to have engage students and have fun while creating an environmentally conscience school culture. And it has proven successful! 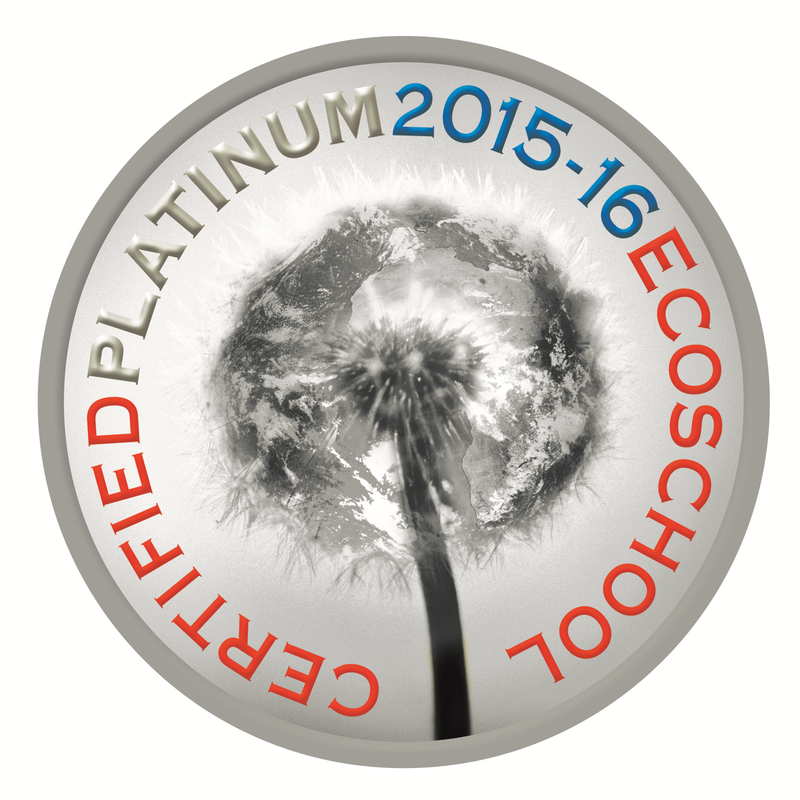 Last June, Howard was awarded Platinum status by the TDSB Eco-Schools. This is the highest honour and we are very proud to achieve it. We hope it will encourage the Howard community to continue and challenge themselves to new heights in their eco efforts. To get involved or add an idea please contact EB parent lead using the contact form at the bottom of this page. We meet Wednesdays at lunch in Area 25 (with Mdme. El-Shimy). All students in grades 4-6 are welcome and can join at any time. Parent Volunteers are also welcome! Details are posted at the very bottom. Our club mission is to learn about our environmental impact and how to reduce it towards a more sustainable future. We then promote awareness to other students through various projects: poster campaigns, presentations, contests, blog articles and eco-tip announcements. Spring Planting: A school wide planting of shrubs and trees in our outdoor beds and veggies and herbs in our learning garden. Earth Week: Howard hosts various events with assistance from the Earth Buddies. Fall/Winter we are focused on waste reduction, beginning with the annual waste audit which helps us assess where we can improve over the year. This year we will are excited to announce a return to Boomerang Lunch along with a continual promotion of our Litterless Lunch and January 2015 sees the roll-out of our Green Bin program for compostable waste. Winter/Spring we are focused on energy conservation and exploring innovations in sustainable sources of energy. We kick off the energy component with a Battery Blitz hosted by The Earth Rangers. The dead battery drop box is in the office until March 31, 2015. We will continue to feed the vermicomposter which we set up last year and now resides in the daycare. In advance of the school-wide spring planting we will harvest our “black gold” worm casings. PARENT VOLUNTEERS ENCOURAGED! Earth week seed planting! Part of the seed-to-harvest initiative begun last year, each student will plant a seed during earth week and nurture indoors until the spring planting – a great opportunity to nurture and grow plants and have a stake in the continued success of our outdoor environment, all seeds will produce plants we can harvest for the Stone Soup Event. Fall/Winter we are focused on waste reduction. Winter/Spring we are focused on energy and CO2 reduction. To encourage 2 eco-reps from each class grade 1-6 to assist the earth buddies spread the word within their classroom. Vermicomposting Workshop and on-site kit. The workshop is on January 28, 2014 in the afternoon. The composting kit will be shared between classes on the third floor throughout the spring. Worm castings, known as “black gold” will be harvested and used in our spring planting. Please see our host’s website for more info: http://www.cathyscomposters.com and be sure to check out her TEDx talk from this past December. Earth week seed planting! Part of the seed-to-harvest initiative this year, each student will plant a seed during earth week and nurture indoors until the spring planting – a great opportunity to nurture and grow plants and have a stake in the continued success of our outdoor environment, all seeds will produce plants we can harvest for the Stone Soup Event. This year Howard will use only post-consumer recycled paper for standard copy pages even at a slightly higher cost to our operating budget. The REAL FOOD FOR REAL KIDS hot lunch program which began in January 2014, will help reduce packaged waste from student lunches at Howard. We expect to see a large reduction in our spring waste audit as a result of this program. All class rooms have GOOS bins – or bins with paper that is “good on one side” and therefore reusable. We encourage families to adopt this practise at home or in the workplace. Waste-free Wednesdays have been a goal at Howard for several years running. Please help us to achieve this when you pack snacks and lunches. If you have ideas or suggestions for Earth Buddies events, please contact the parent volunteer via the volunteer form below. Pack a “Litterless Lunch”! Bring reusable containers for your food and drinks instead of plastic bags and wrappers. They don’t create waste, cost less over the long-run, and they keep your food clean and fresh! It’s also much easier to bring back your leftovers in reusable containers. When you are washing your hands, limit your paper towel usage to ONLY ONE paper towel to dry your hands. Bring a healthy snack of fruits and vegetables to avoid the unnecessary wraps from pre-packaged snacks. Buy large juice cartons (economy size) and pour them into small reusable bottles instead of buying individual small juice boxes. Have you thought about making your own freshly squeezed juice? It’s healthy, delicious and you wouldn’t have to buy juice boxes, which create a lot of waste! 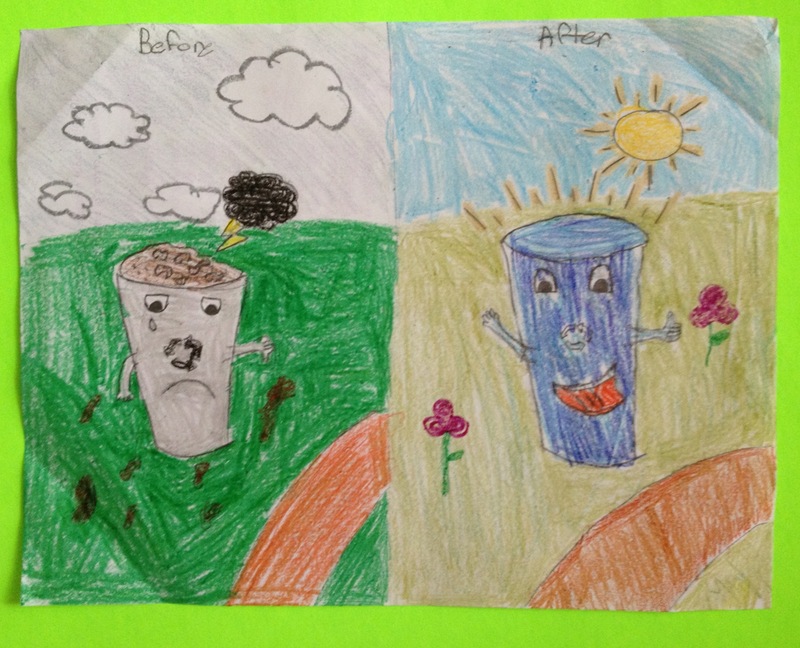 Look at the sorting posters above the garbage bins and recycling bins before deciding where to throw your waste. Reuse paper and save trees! Keep paper that is good on one side and use it for notes, lists, art and homework practice. Put a GOOS (Good On One Side) paper bin in your classroom. Think about creative ways to reuse scrap materials instead of throwing them out. You can create great art projects from different materials your find. Bring a reusable water bottle or a thermos instead of plastic water bottles, which create a lot of unnecessary waste. Great Backyard Bird Count is on !!! Earth Buddies salutes SHAC ‘Fresh Fruit Fridays! Every Friday that you support SHAC’s ‘Fresh Fruit Friday” you support no package snacks and help feed the worm in our vermicomposter! Thank you.for being healthy and being green!!! As many of you know, we had the “Earth Rangers” assembly in on Monday, January 27, 2014. Those interested could sign up and the first mission is a battery blitz! To help ease this goal for Howard students involved, and help those not involved – the Earth Buddies will host a drop off box for batteries during earth week at Howard school. Save your batteries and we will bring them to a recycling depot for you! Or – you can bring them yourselfto Rona at Stockyards or The Soure at Dufferin Mall. Happy recycling! And stay tuned for more details as we approach earth week in April. STOP THE WASTE ALIENS FROM INVADING! 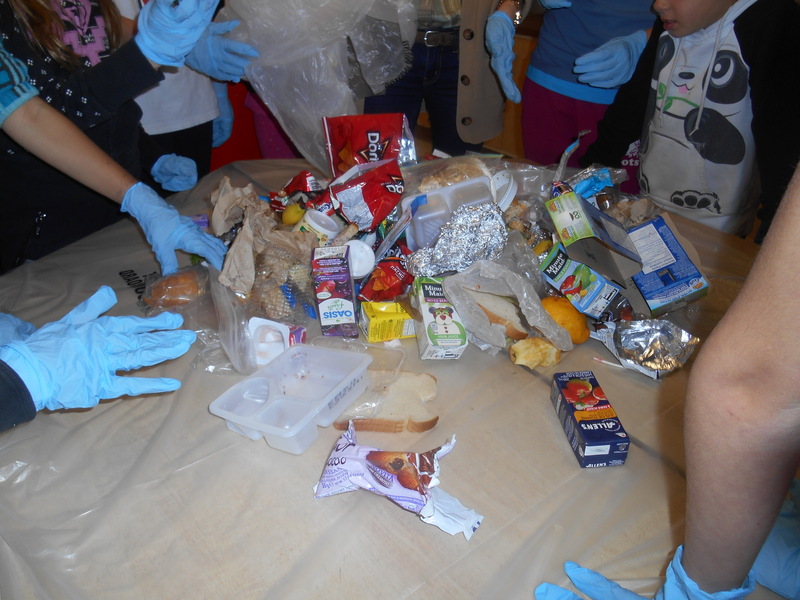 On November 18, 2013 Howard School Earth Buddies did a waste audit of our trash. We collected all the trash made in one day. It weighed over 7 kilograms! But it could have been less. Why? We sorted it into bins of reuseable things (pencils, paper, uneaten food), recyclable things: paper, drink boxes, fruit cups, and compost-able things: peels, cores, paper towels and pencil shavings and just plain garbage. The real garbage only weighed 3.5 which is better but we are aiming for none. Oh! And kids make sure you beg your parents to make homemade cookies, granola bars and muffins. IF WE DO ALL THIS WE WILL STOP THOSE WASTE ALIENS FROM INVADING! Everyday students, teachers and volunteers at Howard are producing large amounts of waste. The Earth Buddies need your help to save our planet and stop producing those large amounts of trash. In this article you will discover shocking facts, how to sort waste and of course, how you can help. The Earth Buddies have been working hard on trying to make this world a better and more eco-friendly place to live in. 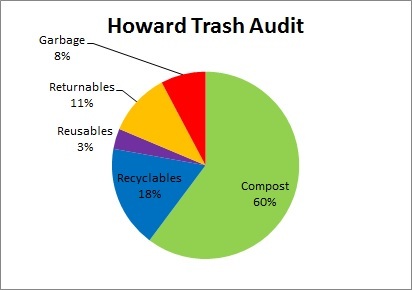 At school a few months ago we did a waste audit to see how much garbage Howard is producing from 9am to 3:30pm. Right now we are working on a waste reduction campaign and are finishing off raising awareness by writing articles, designing posters and preparing skits and announcements. Did you know that 60% of the waste we throw out is really compost? Or that we throw out 35 kilograms of waste each week? But only 2.5 kilos are garbage? Sorting bins is a lot more important than we think. You can help with this problem by checking which bin you throw your stuff out it. It would help a lot. Now its your turn to help! You can be a big help for the Earth Buddies by listening to the eco-tips everyday on the announcements about how you can help. You should use only one paper towel to dry your hands and bring reusable containers and unpackaged and healthy snacks. You can also help by making sure you put your recyclables in the recycling bin and actual garbage in the garbage bin. We need to defend mother earth so the world remain beautiful. Howard promotes litterless and locally grown lunches. The Annual Stone Soup Event was a great success again this year! The Earth Buddies team helped harvest, prepare and serve the soup and a tea made of herbs. After each class was served they were read the story of “The Stone Soup” – a traditional tale that spans across cultures in many ways, as stone, or axe, or nail soup for example where a community gathers together to create a yummy soup with what little each individual has to share. This year was definitely a community event. Our garden was ravaged by beasts of animal and human kid alike but the students donated veggies in such large quantities that together with the herbs and greens from the learning garden we were able to make an awesome soup! But a community effort it was – a big fat shout out of thanks to FatCat Winebar for their continued support of our event via donation of pots and gasburners to cook the soup! Without their help it would have been a cold smoothie, much less savory or seasonal. They’ve recenbtly had an electrical fire and had to renovate but please pass on your thanks when you can. Earth Buddy Yoshi said, “I had a lot of fun, because we got to cook soup, chop up vegetables and have a great time in the learning garden”, he also said “harvesting was very fun because I got to learn a lot about the vegetables in the garden and what everyone was planting”. Earth Buddies Maya and Amelia said, “it was very yummy”, “it was fun to serve everyone but the best part was eating the soup”. Looking forward to next year’s soup – Fall 2014! Weekly volunteer(s) to help at our meetings Wednesday at lunch – feel free to do just one week or more. We welcome guest speakers and animators and enthusiasts to help facilitate the students’ exploration. Project by Project art facilitator to help with new signs in the learning garden, run an recycled art contest and generally propose and run an eco-themed art project. Earth Week: Tech savvy person(s) to help set up bike powered blender display and photographer to capture the parade and mural making. Gardeners to help with spring planting, date TBA: will need at 8-12 half or full day volunteers to help kids weed, move dirt, mulch and plant. Summer watering 2014: annually we look to volunteers to water the learning garden. Each volunteer typically takes on one one week of the summer holidays. Training is provided.